What do you stand for? The answer these days seems to be increasingly an emphatic NOTHING! You can’t make me stand. Why should I stand? I won’t stand! I’m protesting. It makes me think of the Arron Tippin song “you got to stand for something or you’ll fall for anything. You’ve got to be your own man not a puppet on a string. Never compromise what’s right and uphold your family name.” So I wonder, what do you stand for? Obviously this is a hot topic question these days, even having a presidential weigh in! What do you stand for? The Flag? The National Anthem, God? Biblical Truth? Morality? You may even think I don’t have to stand for anything! It’s too politically charged to stand. It’s too dangerous to stand because everybody is against everything these days. It’s uncomfortable to stand so I’d rather sit. But do you realize when nobody stands up for anything, everything goes? Bullies can get away with bulling anybody and everybody. Why? Because nobody will take a stand against them. Lies and deceit can be peddled as truth unabated. Why? Because nobody will take a stand against it. Morality and Biblical Truth go down the drain and nobody batts an eye. Why? Because nobody is taking a stand for it. SO why not stand for something worthy? 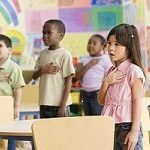 I remember in kindergarten class, 5 years old in Austin Texas, I was taught to stand for the pledge of allegiance to our Country and Flag. Since that time, I have stood for the Flag. I have always been proud to be an American. Why? Because we stood for what was right. We stood for what was good. We stood for what was Truth and Holy and Righteous. We as Americans, we as Christians, made a difference in the world because we chose to stand for what God declared was GOOD and against that which was evil. I was taught to stand for the National Anthem as a young boy as was everyone in my age group. I played sports in school and you better believe we proudly stood when they played the National Anthem. When I went to civic events we all stood for the National Anthem. As a Cub Scout and later a Boy Scout, we all stood for the pledge of allegiance and the National Anthem. At high school and college graduations we all proudly stood for the National Anthem. At military and political events, we all stood for the National Anthem. All of my life until these recent troubled times when ever, where ever the Star Spangled Banner was played everyone gladly and proudly stood up and knowing we were part of this great country. As I see it the simple truth is this, whether we stand or sit idly by there is right and there is wrong – like two opposing sides of a coin. There is truth and there are lies. There is God and there is the serpent in the garden. There is a heavenly kingdom and there is a fallen world. There is good and there is evil. And every person makes a choice and will be aligned with one or the other. Every person will be consenting to one or the other, whether you stand in consent or sit and consent in absentia or indifference. So, I ask again, what do you stand for? As Joshua said, “If serving the LORD seems undesirable to you, then choose for yourselves this day whom you will serve”, whether the false gods of political correctness, inclusion, non-offense, or money and greed, or the self-serving lawlessness of the land you are living in. “But as for me and my house, we will serve the LORD”. We will stand for the Flag, and for the National Anthem. We will stand for God, for Biblical Truth, for righteousness. We will stand against evil in all its forms. We will stand against Tyranny and oppression. We will stand against political incorrectness and injustice perpetrated by lawless politicians and judges who seek to destroy our great nation from within. We will stand and proclaim biblical truth and faithfully follow Jesus Christ, the son of the living God for as long as we have breath. We will stand together on the solid rock as brothers and sisters. Won’t you stand with us? A favorite southern tradition of mine is eating boiled peanuts. I just love them. The delicious salty flavor makes me salivate just writing this. The store at the corner where I live almost always has bags of fresh boiled peanuts in the display cooler to grab for a snack. One frustration I have is that while most of the peanuts when you crack them open contain nice full nuts and are delicious, some are not so good. Some are obviously immature and not filled out and I know not to expect much from them. Some are obviously bad and you can see the dirt or rot plainly. I avoid those and throw them out immediately. Still others look perfect on the outside but when you get past the shell they are empty inside or have barely any substance. These are the ones that bother me most. What my heart desires when I purchase a bag is for all the peanuts to be perfect, well-formed, full, salty and delicious. But sadly that is never what I get, a good portion are misshapen and empty and aren’t fit for consumption. But the worst of all are those that look wonderful on the outside but after investing the time to open are empty or not fit to eat. As a Pastor, I often hear new people complaining that their experience with churches sadly are very similar. They have an expectation or a strong desire to find a church, a good church that is full of beautiful, loving, salt and light Christians. They come to “taste and see” and instead of finding a church full of good and holy and righteous people that are fulfilling and soul satisfying. They encounter more bent, broken, empty and sometimes down right rotten folks than the loving disciples and Christ followers they had hoped to find. They encounter murmuring, gossiping, bitter, backbiting, contentious saints who are so selfish and self-centered that they are of no heavenly good. My friends this should not be so. I still love boiled peanuts, and the church, but I love them both so much more when they are full and salty and soul satisfyingly good. Let us therefore strive all the more to be fully who and what Christ intends us to be. I urge you to live a life worthy of the calling you have received. Be Salt and Light so that the world may taste and see your good works and give glory to your Father who is in heaven! Are you a Genuine Believer? I recently read an article that stated “The task at hand, for every genuine believer, is to recognize evil so that it may be either shunned, or engaged in battle and defeated—wherever it is found.” This got me thinking about the “task” and the aspects of it that make it difficult. The word “genuine” immediately jumped out right before “recognize” and finally the word “battle”. These three elements are our clues to accomplishing the task set before us. First things first, be a genuine believer. This quickly reveals that not all who profess to be believers are genuine. Some are hypocrites, those who talk the talk but don’t walk the walk. They are not the real deal but masqueraded as believers. The bear a resemblance to believers but don’t pass the test of time. We have to be not only those who profess to believe but genuine. We have to be authentic. We must prove to be true when tested. I was on a bus yesterday with a bunch of church youth, some from the country and some from the city. We were headed to the Madison Youth Ranch to put in a work day and to visit with the kids there afterwards. As we came into Madison on a damp morning, we passed a large group of buzzards on the ground near a house trying to dry their wings. I was looking for a carcass knowing they were vultures and the nature of a buzzard. When a young girl from the city behind me holler out excitedly, “look, look, everybody! Look at all the chickens!” When I regained my composure I marveled that someone could fail to recognize a buzzard and mistake it for a chicken. The second key term is to “recognize” evil. It is imperative for a believer to recognize evil. Genuine believers must be able to distinguish evil from that which is good and acceptable. We must be able to discern its presence in all the ways and places it hides. We must see through all its disguises. We must know who sets the standard, who determines what is good and evil and know it is God, not man. Last we must be daily aware that as genuine believers, each day is a battle so we must enter it prepared. We need to be ready to resist evil and its temptations when we encounter them. We must be wise concerning the scriptures so we can discern evil when we see it. We need to have the word of truth hidden in our hearts to speak out against it so others may take heed. We need to put on the full armor of God, every day so that we may stand and fight the battles that come because the “days are evil”. If the task at hand, for every genuine believer, is to recognize evil so that it may be either shunned, or engaged in battle and defeated—wherever it is found. And you are not about the task at hand… Maybe the question comes down to this – are you a genuine believer?